Adobe has started shipping its highly anticipated design software suite - Creative Suite 5. 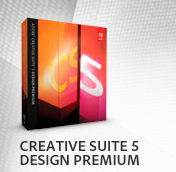 The Creative Suite 5 line-up includes five new versions: Creative Suite 5 Master Collection, Creative Suite 5 Design Premium, Creative Suite 5 Web Premium, Creative Suite 5 Production Premium, Creative Suite 5 Design Standard, as well as 15 point products and associated technologies. Creative Suite 5 also includes a brand-new component, Adobe Flash Catalyst. Also available as part of the Creative Suite 5 product family, sold separately or in one of the five Creative Suite editions, are new versions of the Adobe Creative Suite tools, including Photoshop CS5, Illustrator CS5, InDesign®CS5, Flash Catalyst CS5, Flash CS5 Professional, Dreamweaver CS5, Adobe Premiere Pro CS5, After Effects CS5 and more.